New German bayonet adapter for HK91, G3, PTR91, HK93, HK33 or clones. Also works for the Cetme if you want to use a German bayonet. This bayo adapter attaches under the front sight and replaces the cocking tube end cap. Easy installation, this allows you to have all the 'pre-ban' features on your HK style rifle. Fits any HK91/G3, HK93/33, PTR91, Vector, C91, C93, Cetme, C308 or other clones. These come with the current generation metric hex screw and washer. For those wanting the older style look from the pre-ban era HK91/93, we also have old style flat head screw and locking plate. 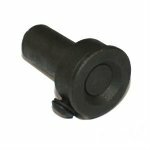 We do not have the original washer that they would have come with but the washer included with this adapter will work just fine. Product Review: Excellent condition. Dropped right in the GI I'm working on. Locks in good with a correct German 12 groove bayonet. Product Review: I bought this for a PTR 91 GI, and I am very pleased with it. Everything fit as it should, as well as the German bayonet did. The part is new, with a tough finish on it. Product Review: Part was new, but was gray in finish, not black, other than that it works perfect on my ptr91 with portugese made bayonet. "New part / easy install." Product Review: Came brand new and was easy to install on my PTR. My G3 bayonet locked right on. Looks amazing. Thank you RTG ! 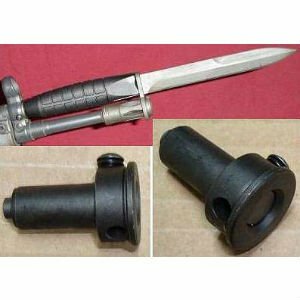 "Make sure you have a German Bayonet not a Swedish Bayonet"
Product Review: I bought a Swedish G3 Bayonet and it does not line up, so I will have to drill a new hole in the side. I assume that a German one would work? Also if you have a new PTR rifle with the black finish be prepared to drill a hole in the original dustcover to pry it out of the tube. Once you do that though, this adapter fits in without any problems.